Dr. Lorenzo Pace is an artist, author, master storyteller and performance artist, and lecturer. Pace held his first exhibition at the School of the Art Institute in Chicago, where he graduated with both a BFA and an MFA. Pace went on to receive a doctorate in art education from Illinois State University and later made his home in New York City. Pace works with a broad range of objects and materials. His sculptures, installations and performance art have received international acclaim and he has exhibited in galleries and museums all over the world, including New York City galleries, the National Civil Rights Institute in Birmingham, AL, as well as galleries in China, Brazil, Senegal, Suriname, Peru, and France. Pace has been featured in a variety of media, including the New York Times and New York Arts Magazine. In 1993, Pace and his artwork skyrocketed to national attention when he was commissioned to build a monument at New York City’s Foley Square paying homage to the African slaves originally buried on that site. 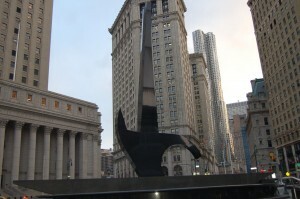 In 1991, the remains of more than 400 African slaves were excavated during the construction of a federal building in the city’s financial district. The City of New York wanted to create a memorial and Pace was chosen. His work resulted in a beautiful 300-ton granite sculpture named “Triumph of the Human Spirit.” A replica of the lock that shackled Pace’s great-great grandfather, Steve Pace, is a part of the base of the monument. Pace is also author of four children’s books, including Jalani and the Lock, which was described by Publisher’s Weekly as a “stunning debut” and chosen as a “Best Book” by the Los Angeles Times. Other books by Pace are Marching with Martin, Harriet Tubman and My Grandmother’s Quilts, and Frederick Douglass and the North Star, published this year. Pace is known around the world as a master storyteller and performance artist. His book performances are full of music, singing, dancing, joy, and laughter and provide an experience unlike anything most people have ever seen with an author. Audiences of all ages, backgrounds, and dispositions are compelled by Pace’s magnetic personality, exuberance, and storytelling talents to participate in his magical journeys through words and images. They leave breathless, smiling, and full of gratitude. Pace has served as Director of the Montclair State University (New Jersey) Art Gallery, is currently Professor of Art at the University of Texas – Rio Grande, and maintains a studio in Brooklyn, New York.